1. Preheat the oven to gas 4, 180°C, fan 160°C. Bring a large pan of salted water to the boil. Blanch the sweet potato for 2­3, then drain. 2. 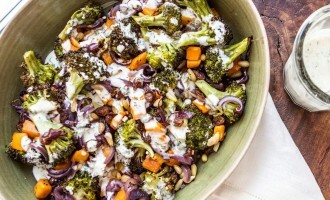 Put the sweet potato, onion, garlic, broccoli, pine nuts and sultanas in a nonstick roasting tin. Drizzle with olive oil and toss to coat. Season well and splash over a small glass of water. 3. Roast the veg in the oven for 20 minutes, then transfer to a serving bowl. 4. Make the dressing by whisking together the soured cream, mustard, celery salt and tarragon. Add milk, a little at a time, until it reaches a drizzling consistency. 5. Serve the roasted veg warm, with the dressing on the side as an accompaniment to grilled meat. Alternatively, leave to cool and enjoy as a salad or as part of a packed lunch.